Pat has worked in the area of social care for 30 years. He initially worked with homeless people in Cork and then became involved with the justice system, assisting people in the probation services. Pat then moved to Tipperary to work with young people placed in state care residential services. Pat transitioned into the area of management and leadership when he was involved in the development and management of high support residential services for vulnerable young people placed in state care services in the South East. He was appointed Child Care Manager in the HSE South Area in 2006. He held responsibility for community based child protection systems and worked with social care services, community service providers and agencies to respond to and manage child protection concerns and support families in the community. In 2008, Pat took up post as Inspector Manager with the Health Information and Quality Authority, which regulates children and older person’s services across the State. 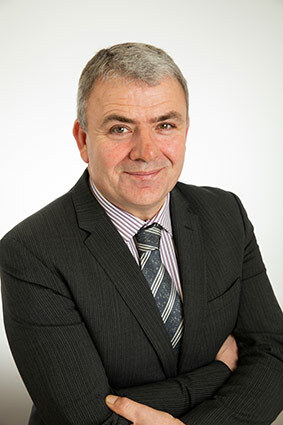 With HIQA, Pat managed a team of inspectors, and in 2012 he was a member of the first team to undertake the inspections of community based child welfare and protection services operated by the HSE. In Oberstown since 2013, Pat has led in a significant change programme, namely the amalgamation of three detention schools, the completion of the €56,000,000 building capital project and the modernisation of the operations of the facility to meet care and safety needs of young people.